Opening of the Fourth Ohio Constitutional Convention, Ohio Statehouse, Columbus, Ohio, January 9, 1912. In the early twentieth century, many Ohioans believed that the current state constitution was outdated. Progressives were attempting to rid politics of corruption and inefficiency. Many reformers believed that the government should do more to protect its citizens and the nation's moral values in an era of rapid change caused by industrialization, immigration, and urbanization. In 1910 Ohio voters approved the calling of a constitutional convention. 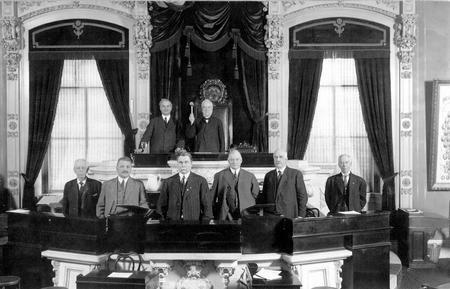 The constitutional convention began meeting in January 1912. Cincinnati minister Herbert S. Bigelow served as president, and Simeon Fess was the vice president. After much discussion, the convention decided not to create a new constitution. Instead, convention delegates wrote forty-one potential amendments to the current constitution. These proposed amendments were presented to the citizens of Ohio in a special election on September 3, 1912. Voters approved thirty-three of the amendments and rejected eight others. The approved amendments reflected many Progressive reforms of this era. The constitution was amended so that the legal process in the state reflected rights granted to the accused under the Bill of Rights of the United States Constitution. In addition, amendments granted the state the power to pass legislation that regulated working conditions in factories, set an eight-hour day for public works employees, and create a mandatory workmen's compensation system. The initiative, the referendum, municipal home rule, and direct primary elections were also approved. There were amendments passed that dealt with education and conservation issues as well. Ohio voters did not approve amendments that would have granted women the right to vote, abolish the death penalty, allow the state to regulate outdoor advertising, or provide for the use of voting machines in elections. There was also an amendment that would have removed the word "white" from the constitution. The language of the constitution would be more reflective of the rights that existed for all of the citizens of Ohio. Ohio voters refused to support this amendment as well. In the end, the Constitutional Convention of 1912 and the amendments that came from it reflect both the positive influence and the limitations of the Progressive movement in Ohio. The state made a number of advances, particularly in the protection of working people and in the extension of democracy in the political process. At the same time, many Ohioans were not yet ready to extend full rights to women or recognize the equality of the state's African-American citizens. Lamis, Alexander P., and Brian Usher, eds. Ohio Politics. Kent, OH: Kent State University Press, 2007. Steinglass, Steven H., and Gino J. Scarselli. The Ohio State Constitution: A Reference Guide. N.p. : Praeger Publishers, 2004. Warner, Hoyt Landon. Progressivism in Ohio, 1897-1917. Columbus, The Ohio State University Press, 1964.